Dustin Bennett’s mom calls it a miracle; his doctors at Mayo Clinic know it as an example of what the future of health care holds for all of us. Dustin, a 23-year-old from Pearson, Georgia, had suffered most of his life from extreme jerking that would mysteriously start and stop. Doctors at Mayo Clinic’s campus in Jacksonville, Florida, found the problem that other tests had missed. They sequenced his entire exome and found he has a variant of a very rare form of a neurological disease. Dustin Bennett, from Pearson, Georgia, found answers at Mayo Clinic. Dustin now is on medication that is changing his life; he can attend school and play basketball. His successful treatment shows how the promise of genomic science can lead to the actual practice of genomic medicine. Mayo Clinic is proud of its history in helping pioneer genomic and regenerative medicine that helps prevent, predict and treat disease. Other patients also are benefiting from similar scientific advances. Clinicians are using stem cells to help re-grow bone for patients with knee problems. Still other patients are benefiting from new approaches. For example, sarcoma patients benefit from tumor boards. These boards are comprised of Mayo Clinic cancer specialists and Mayo Clinic Care Network member sites across the nation. These specialists use technology to connect weekly to advise on treatment plans for patients with the toughest cancers. Intensive care unit patients now are monitored by a doctor’s “second brain,” a system launched by a company Mayo Clinic helped create. It’s called AWARE. It continuously surveys the patient’s condition and provider actions, uses data trends and compares these data to a database to predict changes in the patient’s condition. It then gives physicians the information needed to make critical early decisions that save lives. 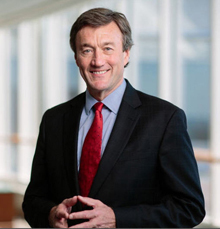 Mayo Clinic envisions the future of health care as one where it helps 200 million patients by 2020. Mayo will accomplish this by applying innovative science and data to study the quality, safety and value of health care. It also involves scaling Mayo Clinic’s knowledge and partnering with others to determine how health care providers can deliver the best patient care. Watch a video of Dustin.